Overlooking one of Ayia Napa's most famous beaches, Grecian Bay, the large bar, lounge area and pleasant grounds make this hotel very popular. There is also a tennis court as well as plenty of facilities to keep you entertained. We were on our honeymoon and on our first evening we had a bottle of champagne and pastries in our room - this was a lovely start to our stay. We found the hotel better than advertised in the brochure, well worth the money. A problem with our shower was fixed within a couple of hours as promised. We ate out every evening, but at breakfast time there was always plenty of choice, and even if we came down late there was still plenty of food which was still fresh. All the staff were friendly and polite. It was always clean, both inside and out. We would definitely recommend this hotel and would go back again. Spotlessly clean, pool area great, new comfy sofa/sunbeds were put out when we were there. Couple of minutes stroll to a beautiful beach. Water was cool in April but very clear and blue, lovely for swimming. Hotel food was fab with many choices to suit all tastes. We also used the gym which was well fitted out. Hotel towels for use round the pool. Great hairdrier in the hotel room, beds very comfy, shower was excellent + a bath. Rooms cleaned every day. 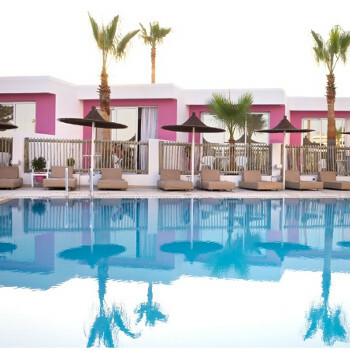 If I ever go back to Ayia Napa (I like to try new places) I would most definately stay here. My boyfriend and I had a fantastic time at the Napa Mermaid Hotel. We have just returned from a 2 week holiday and would recommend the hotel and its location to anyone. We wanted to be in walking distnce of the bars and restaurants in Ayia Napa but not staying in a noisy hotel and the Napa Mermiad was perfect. It was about a 10-15 minute walk to the centre which was fine for us as a couple and there were a number of bars and restaurants on the way. The hotel was really nice and our room had a great view overlooking the pool and we could also see the sea. The pool was lovely and unlike many places we have stayed in the past, there wasn't a 7am rush for a sunbed. We could go down after breakfast and there would still be sunbeds available. The breakfasts were lovely and cannot be faulted-cereals, cooked food, cakes, cheese and hams, bread, fruit, yoghurt-basically anything you could want. The staff were all very plesant and helpful at all times. Despite being Bed and Breakfast we also had a couple of meals in the evening which were buffet style and once again very nice. The poolside bar had an extensive menu and we ate there a lot-again it was very nice. The rooms were cleaned daily by the maids and were more than adequate. The air con was a great relief as the temperature was in the 40's. The Napa Mermiad Hotel is perfectly placed for visiting nearby Cape Greco and Protaras and the beach across the road -Grecian Bay-is lovely, sandy and crystal clear water. The buses run past the hotel and drivers are typically happy to pick you up and drop you off pretty much wherever you want to go. All in all we had a fab time and I would advise anyone to stay at the Napa Mermaid. It is suitbale for couples and families alike. The only downside seemed to be the entertainment which was pretty much limited to cabaret acts-we went out every night but to be honest in Ayia Napa there is no shortage of entertaining bars and karaaoke bars if that is your thing. We have just returned from a two week family holiday and wedding at the Napa Mermaid and what can I say - Absolutely Fantastic. The hotel is spotless, rooms cleaned every day. The rooms are quite spacious. We had a superior room and had a large balcony with table & chairs and two sun loungers. This was good when the kids went for an afternoon nap you could still sunbathe. The pool area was also very clean with staff walking round making sure no litter is lying around. The hotel is in a good location, nice and quiet but only a 10-15 minute stroll into the main town with bars and restaurants along the way. Eleana's is a good bar, very friendly with happy hour all day. The reception staff were all very polite. The waiters/waitresses also very polite making sure everything was OK and also taking time out to talk to the kids. Maids did a good job cleaning rooms and they were also very polite. The food in the hotel was lovely (one of the reasons we had our wedding reception their). We were on a half board basis and couldn't fault the breakfast or evening meal. They did different theme nights (carvery, bbq, italian) which were all very nice. The entertainment in the hotel was OK. One a morning they did aquarobics and on an afternoon they played water polo, killer darts, tennis. The entertainment on a night was OK with cabaret acts and general knowledge quiz. Most nights we stayed for the happy hour then went down the road to Eleana's bar. We got married in the hotel and had our reception there and could not fault it. The room where we got married and had our reception was decorated beautifully. The food at the reception was out of this world (one of our guests said it was the best meal they had every had). If anybody is thinking of going to Ayia Napa to get married I would definately recommend this hotel. Christos (Manager) and Georgius (Head Waiter) gave it a very personal touch and made the day fantastic for us. Only complaint about our room was the rather gloomy bathroom, however you get used to it and it served its purpose. Our room had excellent side sea and pool view. Room cleaned every day. We had a problem with the aircon and reported this to reception and was told air con was automatic, as it never ever came on we reported it faulty again and it was sorted straight away. Breakfast choice was excellent, including the fried stuff. Hotel is located just across the road from Grecian Bay, which has first class beach facilities etc, and about a 15/20 min. walk from the centre with bars / shops on the way. Hotel entertainment was a bit hit and miss, but bar prices ok and staff friendly. Overall a good hotel in a top holiday area. Family came to stay in this hotel for our wedding whilst we stayed in Grecian Sands across the road. We stayed this hotel on a Bed and breakfast basis. There were a lot of options however we found that if you went for breakfast around 9.30 you were left with hardly any choice. The rooms were very spacious and the made came everyday to both rooms to make the beds . However the rubbish bin was not emptied once and the room was never swept there was an amazing amount of dust in the room at the end of the week. The loctaion of the hotel is great if you dont want the hustke and bustle of Ayia Napa, as we had children with us on this visit the hotel was a good choice and with a loverly beach across the road it was ideal. The entertainment was depressing , I know it is classesd as the winter season but I am sure that must people would mind a litlle entertainment instaed of the "tape music" that was played in the hotel bar most nights . ! I would visit this hotel again only because of the bay , to be honest, Grecian sands hotel , across the road its 4 star looked much nicer. We booked this holiday on the very last minute and after visiting holiday truths website located the Napa Mermaid with very positive reviews. As we had never visited Ayia Napa before we was a little concerned that we would find ourselves right in the centre were all the clubs and bars are located. We normally only ever go self catering but this was a really good offer for half board and its location was ideal as we were attending a wedding which we had not realised when we booked was right across the road from our hotel. Our room was cleaned every day through out our 7 night. The hotel food was excellent and I would defy anyone to say that it was poor and lacked choice. Many of the evening meals were themed, i.e. Cyprus night, BBQ night, Greek night as well as having more formal evenings where it was a set menu but still with a lot of choice. The location could not have been better because the beach was just across the road, and bars and restaurants were easily located with a 20-30 minute walk away. This was our 4th visit to cyprus - normally we have always stayed in Protaras - however I found that a lot of the reports about Ayia Napa being loud and geared towards the 18-30 clubs were unfounded as it caters for all age groups. The hotel staff were friendly in our experience but unfortunately we did not stop in the hotel after our evening meals as we went out exploring the bars in the centre and visiting friends who were staying in Protaras so can not comment on the entertainment facilities at the hotel. However, there was always posters in the communal areas of the hotel advertising forthcoming entertainment. There appeared to be a lot of guests who new each other and the staff and it seemed they had been returning to the Napa Mermaid for considerable time (10,15 & 20 years) so it must certainly have lived up to their expectations also. It definitely deserved a higher star rating than it currently has. I would recommend the hotel to anyone visiting Ayia Napa. We booked this hotel the week before going as we had read such good reports on it. Theres absolutly nothing about this hotel that I could fault. The rooms were very clean as the maid came every day.There was a wide choice for breakfast but its only served until 10am so if your planning a late night you will probably miss it like we did a few times! All the staff were very friendly especially reception man Mike. We spoke to a couple who return to The Napa Mermaid every year, and I can see why. We will be returning next year but for 2weeks because 1 weeks just not long enough. Just returned from a great fortnights holiday. The hotel was spotless, food fantastic, close to the beach, staff very friendly and only too happy to help. Amy who deals with the entertainment side was fantastic, many thanks to you Amy for all you did on my 40th birthday and keeping my family entertained during our stay. Panicos, Marianna and Viktoria, huge thank you's for keeping our glasses filled. George the hotel maitre d was lovely and only too happy to help. The food was great and I will now have to go on a diet ready for our return visit. The hotel is in the quieter end of Ayia Napa and is only a walk away from the town centre. Would highly recommend this hotel to anyone!